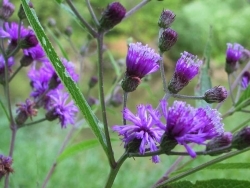 New York ironweed (Vernonia noveboracensis) is one of those inaptly named wildflowers. 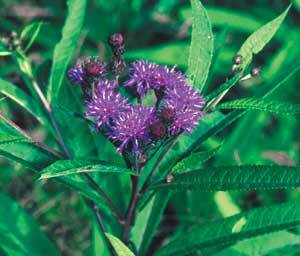 Just as the New England aster (Symphyotrichum novae-angliae) is much more abundant in New York [than the New York aster - ed], so the New York ironweed seems to enjoy the wetlands of New England and Chesapeake Bay as much or more than New York! Wherever you find it in the wild, however, it will have wet feet and will want sunshine. The vivid blue of its flowers (one writer calls it "royal purple") catches your eye and makes it a desirable garden or landscaping plant. The leaves are a dark green and are alternate, narrow, and finely toothed on a thick stem, which complements the blue-purple of the flowers. A member of the Asteraceae Family, it will bloom in August and September, along with its frequent companions, Joe Pye weed and boneset, as well as the many goldenrods and asters. 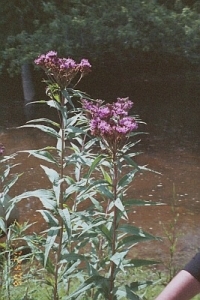 New York ironweed varies in height but can be very tall: 8-10’ high (see photo below)! When I have seen it in the wild it is more like 4-5’ high and bushy, which is very attractive. It is a plant that can be successfully "pinched back" like chrysanthemums, to control its height, make it bushier, and produce more flowers. It definitely needs room but is well worth the space in a garden, a border or a hedgerow. Although its native habitat is a moist area, the plant is surprisingly tolerant of dry conditions. In the Native Plant Garden at the Finger Lakes Land Trust in Ithaca, we don’t water the gardens anymore and the Vernonia makes do with rainfall, grows to 8’ and produces lovely flowers. Ironweed seed can be easily collected and self-sows readily. The plant is a perennial and is native to New York and New England, all the way South to Florida. It grows in Zones 3-9 and is hardy in the Finger Lakes area. It forms large, deep-rooted clumps which are difficult to dig up, so don’t plan on moving it!